The 2019 Mountains to Coast Ride campsite accomodation options include outdoor camping, RV/Camper camping and tent & porter service camping. We also offer the options for participants to stay in local hotels/B&Bs while on the ride. Click here to learn more about that option or keep reading for additional information about the campsite accomodation options. Showers, bike repair services, massage services, local welcome tents, food vendors, portable bathrooms, catered meals, etc. will all be offered onsite or within a short walking distance from the campsite. Campsites will include parks & recreation facilities, town parks, college campuses, YMCAs, community center, churches, historical sites, etc. 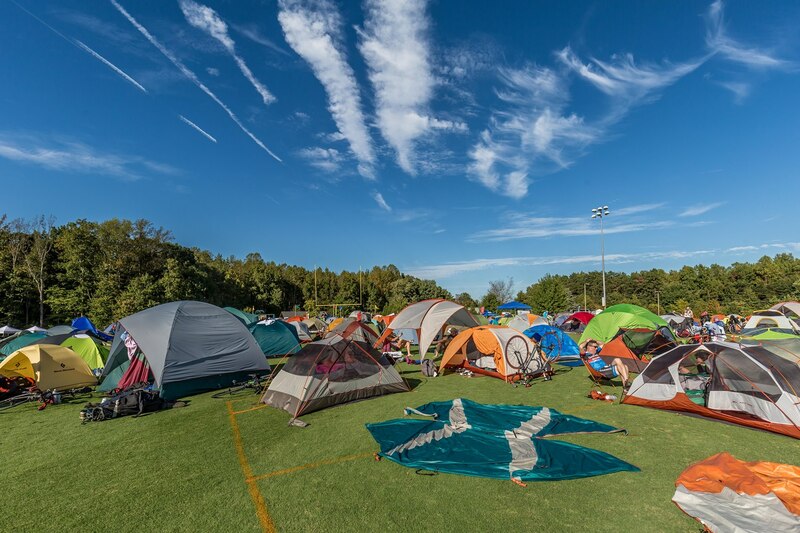 There is no charge for outdoor camping as it is included in your event registration fee. Outdoor Camping is for those who wish to sleep outside under the stars in a tent for the week. Most facilities have enough space to spread out to create your own area. Luggage (no more than 2 bags, each weighing less than 40lbs each) will be transported from campsite to campsite on the CNC Luggage Trucks. This luggage transport is included in your registration fee. ​Note - We will not be offering indoor camping this year due to some facility restrictions and limitations. We have expanded our tent and porter service as an option for our indoor campers. We also encourage you to bring your tent for outdoor camping or explore staying in one of our CNC hotels/B&Bs. RV and Camper parking is located on-site at majority of the campsites. There may be some instances were the parking location is offsite due to limited space at the campsite. Only RVs and Campers with a CNC Parking Pass will be permitted to park overnight. You may purchase a Parking Pass during the registration process or add it to your registration afterwards. Electricity and sewer hook ups are not provided. The number of RVs and Campers allowed may be limited due to space availability. Bubbas Pampered Pedalers - Bubba will supply the tent and air matress in addition to daily set-up and take down, luggage delivery and more!